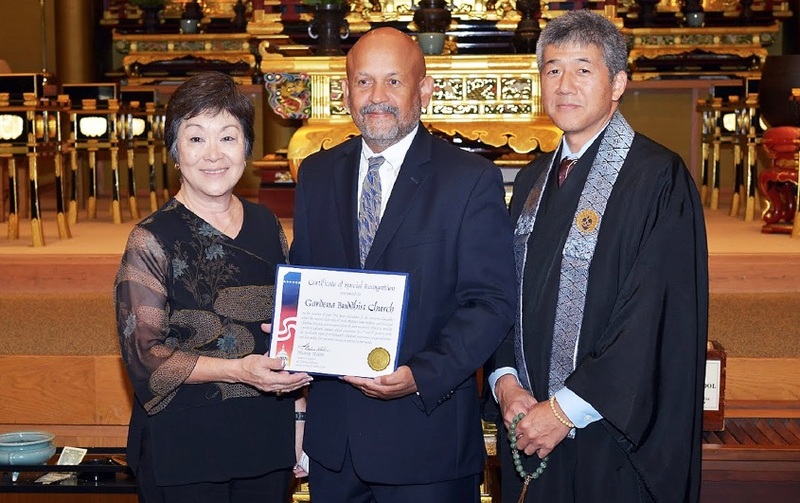 GARDENA — A special certificate of recognition was recently presented at the Gardena Buddhist Church to the leaders of the Wisteria Chugakko. Speaking on behalf of the office of Rep. Maxine Waters (D-Gardena) was her field representative, Hamilton Cloud. He presented the award for the completion of the first year of the Chugakko this past summer. A cultural summer school experience for seventh- and eighth-grade students, the program was run by more than 30 volunteer members of the church and community. Accepting the award on behalf of the school were Charlene Hirotsu, principal; and Rev. John Iwohara, head minister of the Gardena Buddhist Church.